Care: A large tank is required with excellent filtration and regular water-changes. Y. longidorsalis are excellent diggers that appreciate a sand substrate to protect their delicate barbels. Lighting should be subdued. Feeding: Good quality flake, sinking pellets, algae wafers, chopped earthworms, thawed frozen Bloodworm, Mysis Shrimp, chopped Cocktail Shrimp. Yasuhikotakia longidorsalis is distinguished from Y. morleti by the absence of a black dorsal stripe. Distinguishable from Y. eos by high-contrast caudal peduncle crescents (pink and black). Another hallmark are the iridescent "tiger-stripes" on the flanks and some light spotting on the caudal fin. Seldom seen in the ornamental fish trade, not much is known of this species. 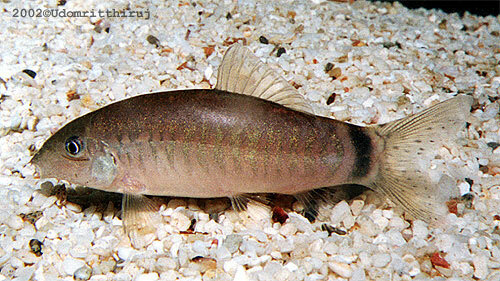 Like other members of its family, we can assume that Y. longidorsalis is territorial in habit, so provide numerous hiding places so that less dominant fish may escape the attentions of more boisterous individuals, and should only be kept with other boisterous loach species, or large, fast moving, free-swimming fish such as large Barb species.